This month, Bay area audiences, thanks to Wily West Productions and the Playwrights’ Center of San Francisco, will have a rare opportunity to feast on a festival of new plays by local Bay Area playwrights with Sheherezade 13, which will be presented at the very avante garde Exit Theatre throughout the month of April. New plays are the lifeblood of the theatre. Don’t get me wrong, the classics are great. I never miss the summer Shakespeare festivals and attend dozens of revivals every year. The Bay Area is fortunate to have an abundance of classical companies that keep the tradition alive and, really, we should be grateful. But let’s face it, Shakespeare has been dead for hundreds of years. Most American theatre lovers have seen multiple productions of Tennessee Williams, Arthur Miller and Eugene O’Neill. No problem; there’s nothing wrong with genius. But imagine the frustration of the contemporary playwright who sees company after company reviving the old masters while she is relegated to only occasional opportunities, staged readings in storefronts and back offices, or second stage series playing second fiddle year after year to every theatre’s mainstage season. Is it no wonder that sometimes our playwrights wonder if producers believe nobody is writing anything worthwhile today? Fortunately, San Francisco is blessed with quite a few dedicated young theatre artists who are truly committed, full time, to new plays. In the forefront of this select group are Wily West Productions and the Playwrights’ Center of San Francisco. Discerning playgoers in Northern California should be aware of their excellent work. Wily West Productions was founded in 2008 with the specific mission of producing new plays by Bay Area playwrights, using local talent for all aspects of their productions. In the beginning, founder Morgan Ludlow provided the bulk of the plays. As their reputation has grown, however, more and more playwrights have contributed work. Today, there are approximately 100 theatre artists associated in one way or another with Wily West, including nearly two dozen playwrights whose work has been promoted by the company. Many of these playwrights enjoy growing national reputations and have won prestigious awards. 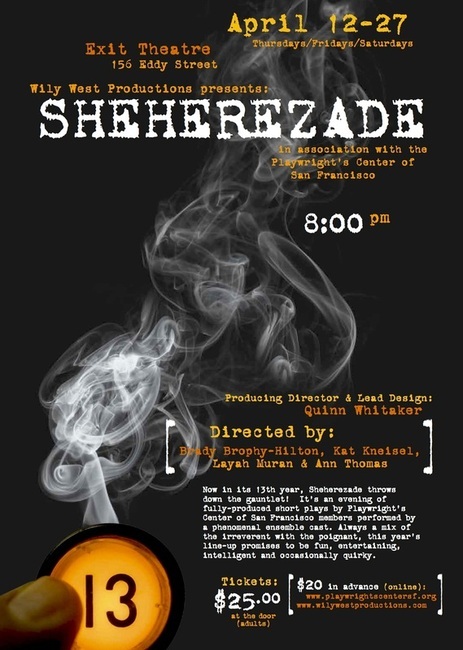 The producing partner for “Sheherezade 13” is the Playwrights’ Center of San Francisco, another leading player in bringing new theatre to the Bay area. The Playwrights’ Center has been pursuing their mission of encouraging and developing local playwrights since 1980. In a workshop environment, they have cultivated playwrights whose work has been produced around the world. Their “scene nights”, where playwrights can bring in selections of work to be read by professional actors with feedback provided, have served the needs of countless artists over the past thirty years. This year’s “Sheherezade” will be the 13th time that the Playwright Center has presented this festival of short plays, and the second year in association with Wily West. Nine playwrights will be featured this year. Some of the playwrights have multiple Bay Area production credits, while others will be showing their work for the first time. This exciting mix of newbies and oldtimers is essential to the spirit of the festival. Beverly Butler’s “Indelible” will be her first staged work in the Bay Area, although she has had other work produced in Grand Rapids, Michigan. Beverly is also a novelist and short story writer. ‘Indelible’ is directed by Wily West’s Kat Kneisel. Mordecai Cohen Ettinger is the author of “Say Uncle”. It is his second fully produced play and is also directed by Kat Kneisel. Elizabeth Flanagan offers us “Pinata Fight” (in the production of which no pinatas have been harmed), directed by Brady Brophy-Hilton, who, among other interesting credits, developed and ran the circus education program for the famous Teatro ZinZanni. Susan Jackson has won a Best Original Play award from the Bay Area Theatre Critics Circle, and has been widely produced throughout northern California and as far away as Sydney, Australia. She offers, “Two to Five with Three Seconds to Go”, directed by Laylah Muran, executive producer for Wily West Productions. The author of “Laura and Curt: A Story of Love and Big Numbers”, Rob McFadden, is surprisingly prolific, having started writing plays in 2009 and already received awards in national competitions. “Laura and Curt” is directed for “Sheherezade” by Brady Brophy-Hilton. Patricia Milton, a past president of Playwrights’ Center of San Francisco, has won numerous awards. Rob Hurwitt of the San Francisco Chronicle has taken note of her “sharp comic writing”. Her contribution to the festival, ‘After Frank’, is directed by Laylah Muran. For a playwright, Bridgette Dutta Portman has the unexpected day job of political science lecturer at Santa Clara University in San Jose. Her plays have been produced in the Bay Area and elsewhere around the country, as far away as Washington, D.C. This is the third time her work has been featured in “Sheherezade”. Her play, “Auto-Incorrect”, is directed by Ann Thomas, founder of Pacifica Table Readers. Jennifer Roberts, author of “Chrysomelidae Hide No More” is the current President of the Playwrights’ Center of San Francisco and the receipient of a Creative Writing MFA from the prestigious California College of Arts. “Chrysomelidae Hide No More” is directed by Brady Brophy-Hilton. Last on our (alphabetically ordered) list of playwrights is Diane Simpson, a member of the popular Bay area playwriting workshop, Playground, which specializes in the 10 minute play form. Her play, “Romulus and Jewel: A Ten Minute Travesty in Five Acts”, is directed by Kat Kneisel. The festival plays will be performed by an ensemble of experienced Bay area actors, several of whom will be well known to local audiences. They are Wesley Cayabayab, Joey Cherney, Abigail Edber, Rich Egan, Kate Jones, Karen Offereins, and Peter Townley. Posted in Announcements.Tagged Abigail Edber, Ann Thomas, Beverly Butler, Brady Brophy-Hilton, Bridgette Dutta Portman, Diane Simpson, Elizabeth Flanagan, Exit Theatre, Jennifer Roberts, Joey Cherney, Karen Offereins, Kat Kneisel, Kate Jones, Laylah Muran, Mordecai Cohen Ettinger, Morgan Ludlow, Patricia Milton, Peter Townley, Playwrights' Center of San Francisco, Rich Egan, Rob McFadden, Sheherezade Festival, Sheherezade XIII, Susan Jackson, Wesley Cayabayab, Wily West Productions.